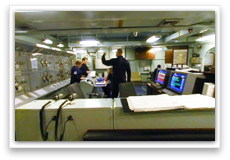 The Ship's Control Centre (SCC) was at the heart of Ark Royal's Marine Engineering systems. 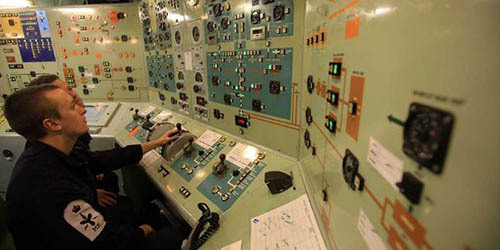 The SCC acted as the primary control position for most Marine Engineering systems and equipment including the propulsion plant, the electrical distribution system and all auxiliary support machinery. Most equipment could be started and stopped from the SCC and sensors constantly monitored running parameters, giving an audible and visual alarm warning if safe parameters were exceeded. Manned 24 hours a day by a team of engineers, technicians and mechanics, the SCC was truly the heart of the ship, ensuring the ship moved, stayed warm and dry and had all the electrical power needed for its aviation, weapons and domestic services. Ark Royal's propulsion system was divided between 4 main machinery spaces - 2 engine rooms and 2 gear rooms. Main propulsion power was provided by 4 Rolls Royce Marine Olympus Gas Turbines TM3Bs from the same family as the aero engines fitted to Concorde, each producing 25,000 Brake Horse Power. The maximum speed of the Ark Royal was around 30 knots. Each engine used up to 8 tonnes of fuel/hr at maximum speed. The engines drove 2 bi-directional shafts through the largest reversing gearboxes installed in any ship in the Western World (4m wide x 8m tall x 5m long). When manoeuvring ahead or astern, the drive was transmitted via fluid couplings but for higher efficiency in the ahead direction only, the drive was transmitted via syncro-self-shifting clutches. Designed and built by David Brown Limited, these gearboxes allowed any number of engines to be coupled in to drive the ship according to the speed required. As the name suggests, the primary responsibilty of this section was the structural integrity of Ark Royal. Working primarily from the Wood and Metal Workshops, the department also maintained the ship's boats, all heads and bathrooms, salt water systems including hangar sprays, sewage treatment plants, drains and scuppers. 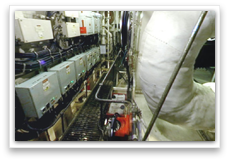 The Vent Party sub-section had responsibilty for the flow of ventilated air around the ship and the maintenance and cleanliness of fan chambers, air treatment and air filtration units. Led by a CPOMEM, the Double Bottoms sub-section (Tankies) monitored and maintained the distribution of fuel around the ship for both aviation and marine engineering purposes. Ark Royal had two distilling plants and one reverse osmosis plants to make fresh water for domestic use onboard. The ship had five auxiliary boilers to generate saturated steam. The steam was used to power the two flash evaporators (distilling plants), used to heat domestic hot water, for ship's heating in cold climates and for domestic services such as the laundry. Fresh water could also be made using a reverse osmosis (RO) plant. The distilling and RO plants were capable of producing a total of 18 tonnes of fresh water per hour. The average usage was between 5 & 10 tonnes per hour depending upon whether or not the Carrier Air Group (CAG) were embarked. The Outside machinery section was also responsible for the maintenance of the ship's refrigeration and chilled water plants. 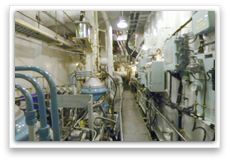 Chilled water was distributed around the ship for air conditioning and for the cooling of electronics and weapon systems. Electrical power sufficient to light a small town was provided by eight Paxman Valenta Diesel Generators (DGs) similar to those used in high-speed trains. These units consumed a tonne of fuel per hour. In battle conditions the ship required 4 generators; in normal sea conditions, 3 generators; and only two when in harbour. The remaining units provided backup power in the event of a failure of a running unit. Electrical power was generated at 440V for high power use and then transformed to either 240V for the majority of computers and domestic supplies for mess decks, or 115V for lighting and domestic sockets. Led by a Lt and a Charge Chief this highly specialised team maintained the aircraft lifts, the flight deck ancillaries including communications with aircraft on deck and all the lifts which allow missiles and bombs to be safely transported to the aircraft. This section also maintained the ship's hydraulic systems used to drive boat davits, capstans, the crane, stores lifts and steering gear. 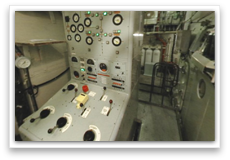 Click on one of the photos below to view a panoramic image of the compartment.